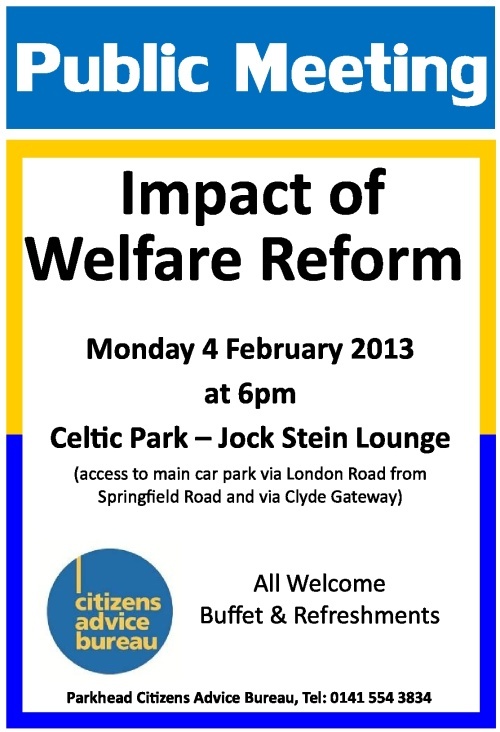 The meeting will take place on Monday 4th February 2013, at 6pm, in the Jock Stein Lounge at Celtic Park. Robert Hinds of Glasgow City Council Welfare Rights will be giving a presentation on the changes and the likely impacts. There will be a buffet and refreshments following the presentation. The meeting is open to all and should be of interest to existing and potential benefit claimants as well as agencies working with people who are likely to be affected by the changes. If you need more information please contact the CAB office on 554 3834.